The theme for this week's competition is 'dance' or 'dancing'. Anything from ballet to ballroom; folk to street; dad dancing to raving; the first dance at a wedding...there are many possibilities. The usual rules for the weekly competition: entries can have been taken at any time but must be with Pentax cameras. Only a few entries this week and almost all taken outdoors, which is surprising, given the subject. 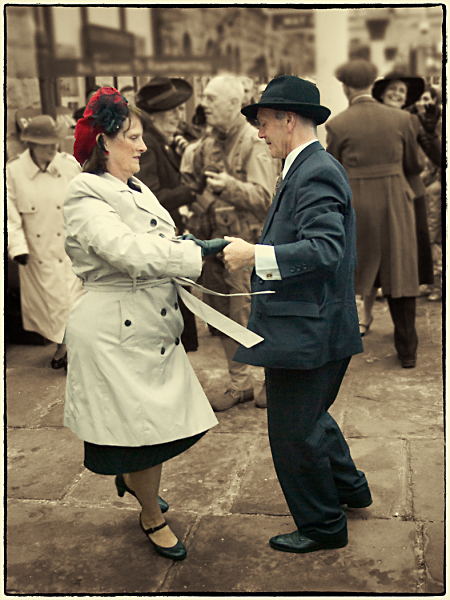 I have chosen 'Dancing In The Street' as the winner as it illustrates beautifully the nostalgic pleasure of older couples enjoying a dance. I'm not a birder but I assume this was submitted because it shows a courtship dance? Nicely framed, though the viewpoint makes it difficult to get a clear view of the interaction between the birds. I like the composition which is assisted by the shadow on the floor and the pattern of the tiles. I would have preferred a shallower depth of field to give greater separation between the subject and the background. The subtle treatment suits the subject, giving something of the look of an old 'colourised' postcard. There is a nice feeling of movement and the participants look like they are enjoying themselves. Another shot that is well framed and captures the movement of the dancers perfectly. Only let down by the background, with the prominent telegraph poles. Nice to see a film entry. A worthy enterprise and a lively group scene. The moment captured perhaps looks more like 'play' than 'dance'? A beautifully crisp and well exposed image that expresses the movement and energy of the dancers. I imagine your 40mm prime restricted you a little, as it would have been nice to have included the whole group of dancers in the shot. HC's to the other entries. Thanks to Smudge for the 1st place and congratulations to the other entrants for the varied interpretation of an interesting subject. Just a shame there was not a bigger entry. Need to have a think about this weeks subject. I'll post it later. Thanks for the comp, judging and second place. Well done to noelm for the top spot. Why so few entries for this? I had to go back quite a long way to find something suitable to enter so maybe others simply struggled to find a competition worthy shot. Congratulations to noelm... had that one down as the winner... "commiserations" to John for the highly valued second spot. cropped out of this and cloned over at the bottom half was a wall in shadow!! Also I couldn't move because of the people sitting on the benches in front of me, and the people standing beside and behind. the fact that there was also a stall promoting Scottish products and whisky had a bit to play toward crowd size, too.... perhaps? ?